Throughout Winter, most people turn to a bowl of soup, stew or curry to get warm and toasty but at times I feel like it’s just a bit too heavy and I need something lighter, but no less comforting. Enter pasta with hearty sauces. 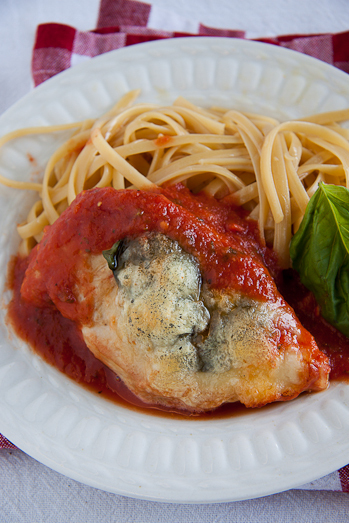 Chicken Parmigiana is originally made by crumbing the chicken breasts, frying them and then placing them in the tomato sauce to bake. I never do the crumbing part. I find that the crumbs almost always goes a little soggy because of the tomato sauce and it adds unnecessary fat to the meal. By just browning the chicken in a tablespoon or two of olive oil it keeps the calorie count down. And if you think this is a meal that will take you ages to put together, you’re wrong. I was telling my husband last night that this is the type of meal every busy person should have in their repertoire. 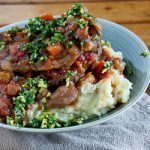 The tomato sauce is made by combining tinned tomatoes with tomato paste, herbs and seasoning. 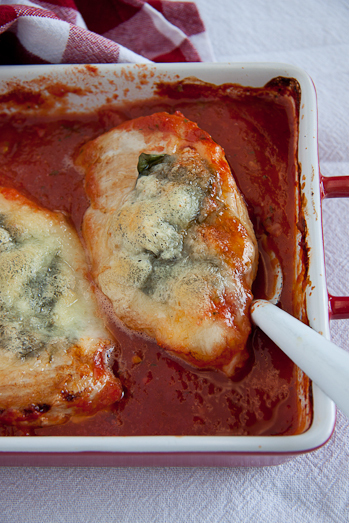 The chicken breasts take all of 5 minutes to brown before being placed in the tomato sauce, covered with basil and mozzarella and being transported to the oven to finish off the cooking. In that time, you can boil the water and cook the pasta. No more than 30 minutes! I promise. In a hot pan, brown the chicken on both sides. Meanwhile, combine the chopped tomatoes, tomato paste, salt, sugar, dried herbs and pepper. Pour this mixture into a deep oven-proof dish big enough to hold all the chicken breasts. When the chicken is browned, place in the tomato sauce. Top each chicken breast with a basil leaf and some of the mozzarella. 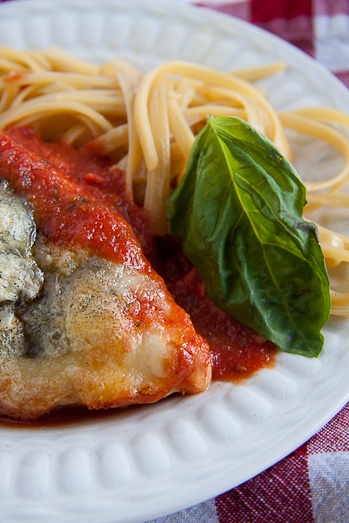 Place in the oven and allow to bake until the chicken is cooked through and the mozzarella has gone crispy. Meanwhile, bring a large pot of salted water to the boil and cook the pasta until al dente (about 10 minutes). Serve the cooked pasta with the chicken and some of the tomato sauce. Sparky, That’s a pity. Not sure why it would come out tough unless it wasn’t very good quality chicken to start with? I made it last night. Absolutely divine and so easy to make.